When Bill Lawry asked Adam Parore prior to the 2001/2 New Zealand tour of Australia if he wanted to be like Ian Healy, he was astounded by the response. Parore replied that while he wanted to do the same role, he felt that he was better than Healy already, and why would he only want to have his results. 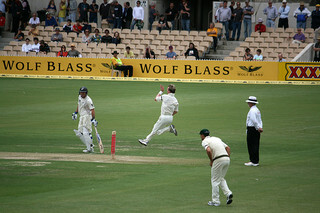 Lawry, who has a reputation for his love of all Australian cricketers, commented positively about Parore's confidence. In that same tour Stephen Fleming was asked by a member of the Australian press if he was hoping to try to get close to the Australian team. His reply was that he was aiming for a 3-0 series win. In the end the series was drawn 0-0 with Australia narrowly avoiding a loss in two matches and New Zealand batting for half an hour with the final two at the wicket in the other match. Coming into the first match New Zealand were in tatters. They had struggled against some state second XI's and there were serious doubts about the solidity of the top order. Their bowling attack was described as shaky and pop-gun. The first test initially didn't do much to allay those concerns. O'Connor limped out after 17 overs with figures of 0/67, Nash picked up 0/93 and the only bright spark was Cairns, who's 5 wickets cost 146. Australia posted 486, kept in check largely through the contribution of medium pace part-timers Astle and McMillan. In the next innings New Zealand were quickly reduced to 55/4. But they didn't give in, and despite struggling to avoid the follow on, declared at 287/8. Australia scored some quick runs and left New Zealand a target of 284 in 57 overs. The game ended with New Zealand only 10 runs short with 4 wickets in hand and Lee and McGrath bowling as wide as they could get away with in order to prevent New Zealand being able to score the runs. In that series, the lowly ranked and unfancied kiwis went in with an attitude that didn't care about the rankings or reputations, but instead believed in their own ability, despite all the evidence to the contrary. The result was a team that almost beat one of the greatest teams of all time in a great 3 match series. Unfortunately in this tour, where a lowly ranked and unfancied kiwi side also take on one of the greatest teams of all time, the New Zealand team have said things like "we're ranked 8th for a reason" and "We've just got to make sure we get better and compete for longer in this series." The aim and expectation was to compete, not to win. Regardless of the lack of quality of a team, and the ability of their opposition, every team should approach every match with an expectation of winning the match, and a plan as to how they are going to do it. That, and only that, is the right attitude to play cricket with. I believe when you settle for the 'we're here just to compete' mindset, you tend to play just to the best of your ability. But when you go with the 'we're here to win' attitude, you rise your game to another level at times and this gives you wins. Ireland in ODIs are one team that take the latter approach than the former and it's not surprising to see them play some cricket beyond their meager skills and win a few memorable matches.